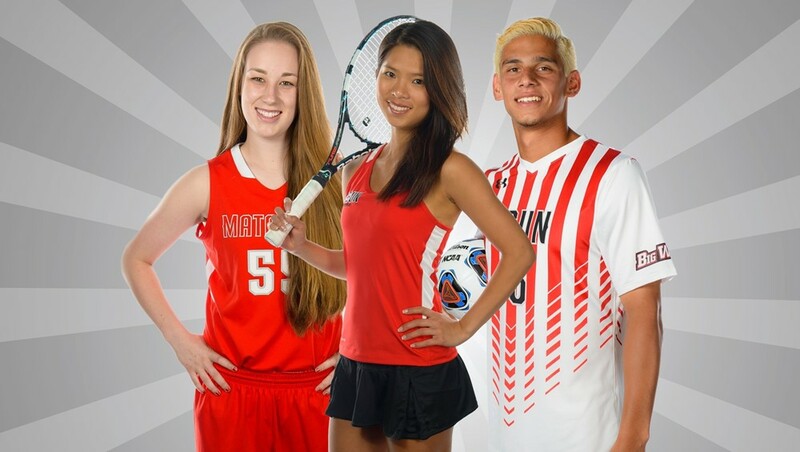 Graduating student athletes Katie King (basketball), Mickey Hsu (tennis) and Juan Fernando Samayoa (soccer) are some of the many athletes who excelled in the classroom and on the field. Photo provided by CSUN Athletics. 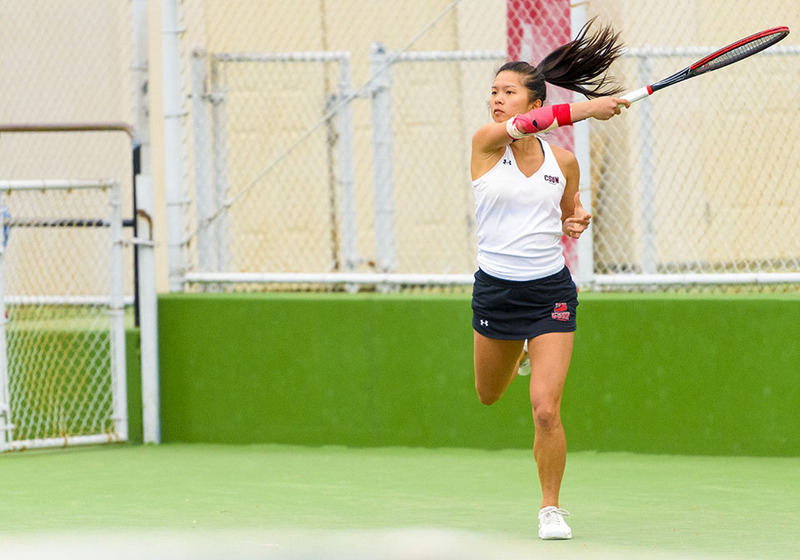 Mickey Hsu was a member of the CSUN women's tennis team and is graduating with a double major in global supply chain management and marketing. Photo by CSUN Athletics. 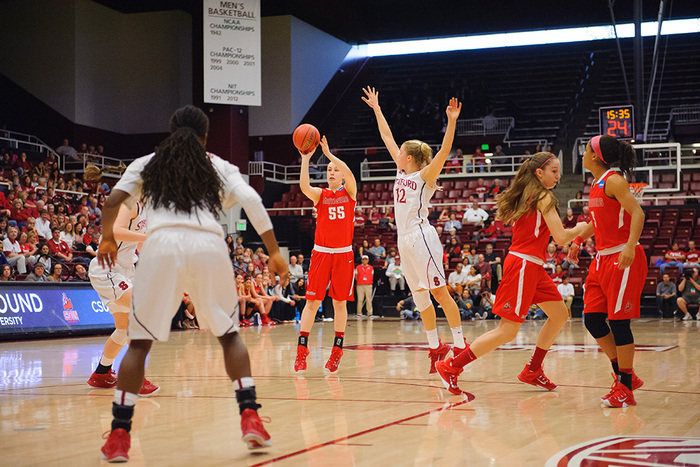 Katelin King helped the CSUN women's basketball team reach the NCAA Tournament her first two years, then injuries forced her into early retirement. She continued as a video coordinator for the team before she graduates with a degree in kinesiology. She hopes to be a coach one day. Photo by CSUN Athletics. 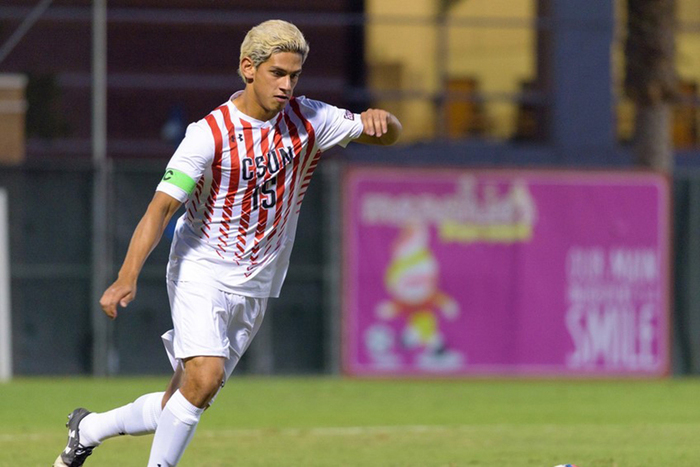 Juan Fernando Samayoa earned First-Team All-Big West Conference honors and helped CSUN reach the NCAA tournament. He is graduating with a degree in Finance, Financial Planning and Insurance. Photo by CSUN Athletics. Sometimes it’s easy to look at college athletes draining three-pointers, smashing forehands and gliding across the soccer field and forget that they go to class, work on papers, participate in group projects and study for finals just like the rest of the nearly 40,000 students at California State University, Northridge. But when commencement ceremonies take place May 19-22, there will be plenty of reminders of student-athletes getting recognized for the classroom portion of their college days. Here are three student-athletes talking about their stories of triumph beyond their respective competitive fields and in the classroom, with a glimpse toward their respective futures. Since she was growing up in Taiwan, CSUN student-athlete Mickey Hsu dreamed of attending college in the United States in order to pursue a better education. As an international student and standout tennis player for the Matadors, Hsu’s years at CSUN have been a journey, but she said she’s thankful to have had the opportunity to broaden her horizons. Four years ago when she arrived at CSUN, Hsu overcame the language barrier and worked hard to meet her goals while pursuing her passion for tennis. She double majored in global supply chain management and marketing. In the future, Hsu said, she aspires to be a global director of a supply chain, a chief operating officer for a Fortune 500 company or even start her own company. “Success is where opportunities meet preparation” is her motto, Hsu said. “I am always working the hardest and giving my best. She climbed that learning curve quickly, achieving a near-4.0 GPA after her freshman year. With English as her secondary language, Hsu noted that it’s more difficult to find jobs. She pushed herself to work harder than her peers. She played on the CSUN women’s tennis team, and the team became her home away from home. As a CSUN student-athlete, she gained mentorship, a group of friends who support her and more confidence in herself, she said. Reflecting on the past four years, Hsu said, her life has changed tremendously. She’s gained new experiences and new friends who have influenced the way she thinks. While CSUN has given her confidence in herself, she continues to value humility because, “I’m always amazed by lots of successful people,” she said. Hsu said she’s excited about her future prospects. Katelin King, a 21-year-old West Sacramento native and kinesiology major, started at CSUN in 2013 and is set to walk across the stage this month during the College of Health and Human Development commencement ceremony. King, known to her friends and family as Katie, has been playing basketball since she was 3 years old and said that her proudest moments in the sport include twice winning Big West Conference championships at CSUN and overcoming her injuries.The summer before she arrived at CSUN, King herniated a disk in her lower back — an injury that required her to have surgery in the summer of 2013. A year and a half later, she was cleared to play as a Matador. Shortly after, she herniated the same disk, had a second surgery and decided to retire. Although she is no longer on the court, King remained a part of the CSUN women’s basketball team, serving as a video coordinator. But King’s accomplishments don’t stop at overcoming injuries and winning championships. In fact, King has multiple academic achievements. King has earned a 3.3 cumulative GPA, made the Big West Conference honor roll twice and has been celebrated twice at CSUN’s Varsity N Athletics Honor Roll Ceremony, which recognizes academic excellence among student-athletes. After graduation, King has her sights set on going to Concordia University Irvine to obtain a Master of Arts in Coaching and Athletic Administration, and she will be a graduate assistant to the CUI women’s basketball team. “One of our assistant coaches recently got the head coaching job for the women’s team [at CUI], and she asked if I would join her staff and be a graduate assistant while I do my schoolwork there,” King said. A talented basketball player and daughter of a high school head coach, King aspires to be a head coach for a women’s basketball team and is looking forward to the journey on the way to accomplish that goal. Juan Fernando Samayoa has excelled with the Matador men’s soccer team for the past four seasons. Leading the team with six goals and six assists in 2016, Samayoa earned First-Team All-Big West Conference honors and helped CSUN reach the NCAA tournament for the first time since 2013. But his achievements extended off the field as well. Samayoa was one of 29 Matador student-athletes who notched Big West All-Academic Team honors for the Fall 2016 semester, an award given to athletes who maintain a cumulative GPA of 3.0 or higher and competed in at least 50 percent of their team’s games during the season. Samayoa, who is graduating this month with a cumulative 3.2 GPA and a degree in finance, financial planning and insurance, credits his parents for emphasizing the importance of education throughout his time in school. Samayoa hasn’t ruled out playing soccer professionally after graduation, but the 22-year-old is focused on going to law school and pursuing a career in corporate or immigration law. According to CSUN men’s soccer head coach Terry Davila, Samayoa will find success in any avenue he chooses after college.